Radek Simonik founded Axis Paragliders in 1990 as a hang-gliding school. The Paragliding School was added shortly after, along with the shop. The company continued like this until 1997, when the manufacture of reserve parachutes and back protectors started. A logical step for this was the production of paragliders. This started in 2001. 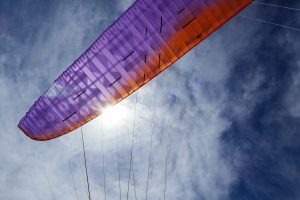 We now offer a full range of paragliders, from school to competition gliders. Ing. Frantisek Pavlousek (a pilot since 1987, a local legend as well, long-time member of the Czech National team and leader of the Axis Paragliders competition team) was developing the gliders with Axis Paragliders CEO Radek Simonik until 2010 when Frantisek left from the company. From this time, Radek and his main test pilot, Stanislav Klikar, are the head of the R&D department. Since the beginning, one thing has always driven us; we wanted to have the better compromise between passive safety, performance and durability on our wings. To do so, we added the latest discoveries to our gliders in order to have the most up-to-date performance and safety features. We were in the very first brands to be working on 3-liners and then on 2-liners gliders. Also, we implemented other technologies such as mini-ribs on the trailing edge, our own 4NHR technology (4 non-hanged-ribs), shark-nose leading edge and many others. Our team of test pilots was always filled with very talented competition pilots such as David Ohlidal, Michal Šneiberg, Stéphane Loisy, and most lately Stanislav Klikar and Téo Bouvard who are able to use their wide experience in all types of conditions to test the gliders to their fullest. Since the beginning, all the wings were tested by the appropriate international laboratories and have matched the certification that was valid at this time, now we are submitting the gliders to the EN/LTF certification. 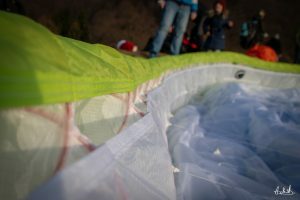 We have been experimenting all kinds of materials for the canopy from different manufacturers to finally decide we would only work with the n°1: Porcher Sport Skytex (27, 32, and 38g/m²). In terms of lines, we have chosen to use Liros PPSL Dyneema lines and Vectran lines. We made these choices after long phases of comparison between materials, weighting the pluses and the minuses of each one to end up to what we think is the best compromise optimal balance of durability, lasting performance and strength. A team of qualified experts supervises production in our locals in Brno and Blansko (Czech Republic). Most of the staff are active pilots. Their expertise and well-developed system of production eliminates possible mistakes ensuring that our customers then receive quality products. We also provide a complete after sale service and technical check-up. From the materials to the manufacturing, everything is 100% made in the European Union. Our factory is working since the very beginning in Czech republic and it will stay like this !